These traced-over drawings, leaked to the excellent Car News China through the Chinese patent office, appear to show the upcoming F12 GTO. They don't. It's a Ferrari, and it's a GTO, but not the one everyone thinks. This appears to be the Ferrari SP Arya, a custom, one-off car built by Ferrari's Special Projects division for a wealthy Indian client in Dubai. Ferrari Magazine profiled the car and the owner Cheerag Arya back in their March issue. So what is the car really, if it's not a F12 GTO? It's actually a Ferrari 599 GTO done up in a very aerodynamic body. Compare the patent drawings to the one render leaked out upon the SP Arya's reveal and you'll see the resemblance. Other clues are the distinctive and steeply raked beltline of the car, the 599-GTO rear-arch winglets, and of course with door mirrors, which are straight off a 599. 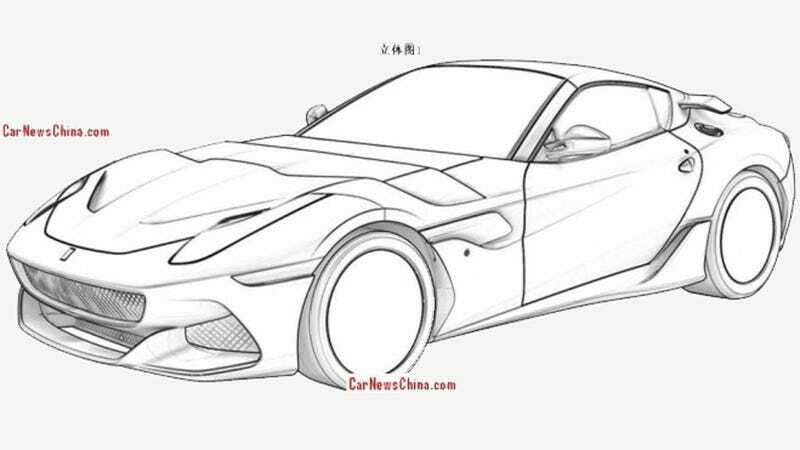 This leak courtesy of Car News China is the second big Ferrari leak of a Special Projects vehicle in just a few weeks, following the SP FFX's patent documents going public in early October.